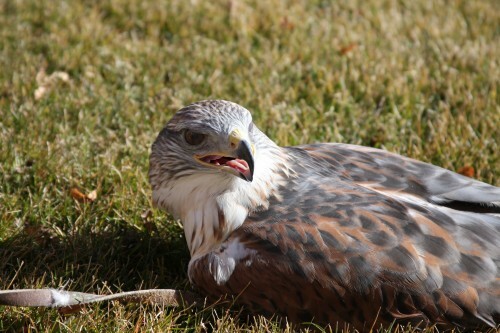 Meet Ferrug the Ferruginous Hawk /Hawks Aloft Inc.
Education is one of our major goals here at Hawks Aloft. 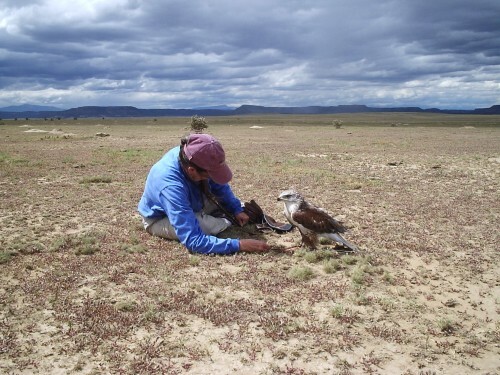 Our educators visit classrooms around the Albuquerque area teaching students about raptors and conservation with the help of our Avian Ambassadors: live non-releasable raptors. All of our education birds have some disability that would prevent them from surviving in the wild and thus renders them non-releasable. Over the next few weeks we will be profiling some of our education birds and this week we will start with one of our most interesting raptors (in my opinion anyway): the Ferruginous Hawk (Buteo regalis). Ferrug attempts to woo the photographer. 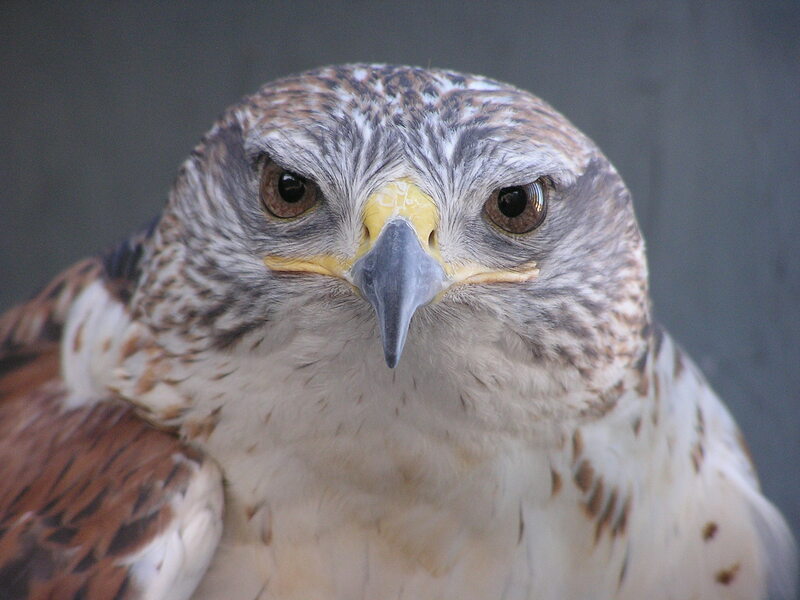 Ferrug is the name of our handsome male Ferruginous Hawk. He is about 16 years old and was found on Rowe Mesa near Glorieta, NM in the summer of 1996. He had a fractured radius and ulna in his right wing. The cause of his injury is unknown and, unfortunately, his wing did not heal well, resulting in limited flying abilities. His disability prevents him from being released into the wild, so he came to Hawks Aloft to serve as an education raptor. To help him get around with his limited flying ability, his mews has been fitted with special ramps designed to help him reach his perches and favorite hiding spots. Ferrug shows off his feathered legs. 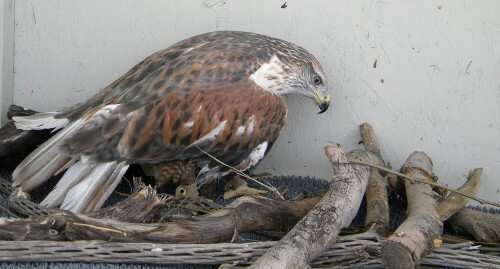 Ferruginous Hawks are an unusual species in the hawk world. 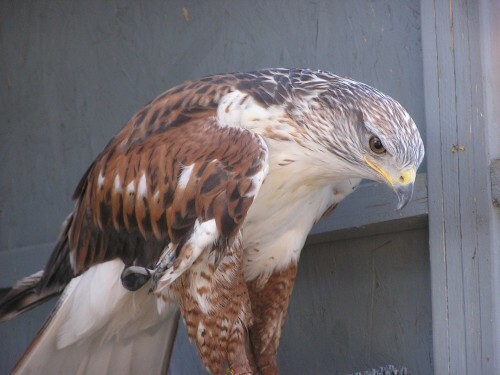 They are the largest of the Buteos in North America and are one of only three American hawks who have legs feathered all the way to their toes. We often refer to him as wearing “pantaloons” because of his long feathered legs. In the wild, his lengthy legs would be used to capture his prey of ground squirrels, rabbits, and prairie-dogs in the open prairies and desert uplands. Ferrug builds a haphazard nest in his mews during breeding season. Ferruginous Hawks are neither threatened nor endangered, but, like all raptor species, human activities are an ever increasing threat. Habitat loss and loss of prey species are the most looming problems. One of their important food sources, the Black-tailed Prairie-Dog, has been the target of extermination operations by ranchers due to their perceived competition with cattle for grass. Ferrug participated in a BBC documentary on prairie dogs. At booths, you will often find Ferrug perched on the ground, a common behavior of Ferruginous Hawks in the wild. His large size and regal appearance makes him a wonderful educational bird although he can get a bit nervous in front of large audiences. He is often vocal and active during presentations, although his vocalizations sound surprisingly like a squeaky toy. Typical of Ferruginous Hawks, Ferrug often prefers to perch on the ground. Learn more about our Avian Ambassadors.